Decorative Finishing Products by Faux Effects International Inc, The Leader in decorative painting and finishing products with information and links to decorative finishing schools, decoratiing and painting classes, fine designer finishing products, and studios. With over 42 years of decorative finishing experience, Faux Effects International continues to set the industry standard for faux painting and decorative finishes. As the manufacturer of the internationally acclaimed professional finishing products, FEI has established itself as the industry leader with a reputation for unsurpassed quality and expertise in the field of high end decorative and designer finishes. 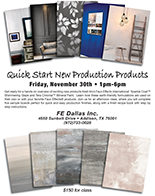 Whether you are a beginning faux finisher, a seasoned decorative painting artist, interior designer, architect, builder or painting and decorating contractor, FEI™ has the products, knowledge, and training to ensure your success. The FEI line of products was developed as an environmentally safe, water-based, low VOC compliant decorating and painting product line for the discriminating faux painter, decorative finisher, and artist, and can be applied to a variety of surfaces through traditional methods as well as with the ProMaster 2015™ Decorator HVLP finishing system. To complement both our Silver and Gold line of professional finishing products, FEI offers Instructional Workshop Classes at our FE Dallas Studio in addition to those offered through FEI's Network of accomplished artists and distributors. These comprehensive workshops are hosted by FEI licensed instructors and cover diverse subjects such as Trompe l'Oeil, Olde World Fresco, Marble, Crackle, Brick and Stone finishes, Metallics, Custom Imprints™, Textures, as well as Furniture finishes including Tortoise Shell, Exotic Burl, Mahogany Ribbon, Verdigris, and Rust wrought iron finishes.